Digital assistants are not some piece of future tech but are currently being implemented by both large and small businesses. Virtual assistants are famous in their own right today. We have adopted them seamlessly into our day to day lives, carrying them around with us on our smartphones and leaning on them as a personal helper to navigate the web, from shopping to managing bills. Our digital assistants are constantly growing more sophisticated, with the latest launch or personalised update being featured all over the news and media. The most famous – and revolutionary - digital assistants go by the names of Cortana (Microsoft), Siri (Apple), Google Assistant and Alexa (Amazon). Coming in many shapes, sizes and forms, whether integrated into a device or piece of software, nearly all assistants respond to the same objective: creating personalised conversations and interactions with consumers. Personal assistants don’t just find you answers, given the right permission, they alsoknow you: your schedule through your calendar, when you have promised to get back to someone through by email, when it is time to re-order some milk based on your previous shopping lists, and much more. For example, Cortana will alert you to the deadline for a task on your to do list, remind you to buy an ingredient, arrange a meeting or even prepare for traffic during an impending car journey to make sure you arrive on time. With over 500 million people using virtual assistants (a number which could go as high as 1.8 billion by 2021), there is no doubt that we as consumers see the value in using digital assistants to make our lives easier and more productive. In our evident perception of this technology, it is clear we see digital virtual assistants a revolution, not just a “fad”. New technologies are often assumed to be adopted primarily by the younger generation, to be taken up and obsessed with until the next shiny new hardware is unveiled, while being ignored by older demographics. However, the virtual assistant phenomenon has traversed the traditional demographic and generational divide, with , research showing that the adoption and usage of virtual assistants of any kind rising across all groups. [Forrester]. Beyond its cross-demographic adoption, what makes this technological wave so revolutionary is that you can also speak with your digital assistant. Human and intuitive means of communicating with technology such as voice search, are changing the way people and technology interact, and encouraging more proactive engagement on the part of the user. According to Mary Meeker’s Internet Trends Report, by 2020, 50 per cent of all searches will be made via voice. When we ask a question, as opposed to typing it, we use words like ‘how, why, when, where’ and reveal more information about our true intent. ‘Where can I find a funky blue jacket for my brother’s 60s themed birthday party on Saturday?” for example, provides further context around the occasion, style, urgency and location than a written search: ‘men’s blue jacket’. This deeper insight into the mindset of the consumer, how their thought process and motivation led them to that particular blue jacket, coupled with an incredibly broad user base, creates a set of data and insights that can better inform a brand’s marketing campaign strategy. This also helps marketers to make sure that their strategy is as cost effective and impactful the first time round, helping to reduce how often they want to recalibrate based on data feedback and the existing tailored insights. 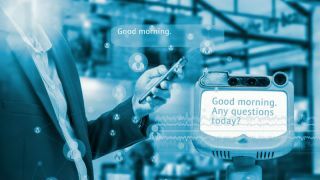 For marketers and brands, huge potential also exists in capitalising on the ‘conversational commerce’ engagement opportunities within the new gateway to the digital world that digital assistants represent. One way in which businesses are making this a reality is through Microsoft’s Cognitive Services which give (literally) developers the tools to create new apps that see, listen, articulate, understand and interpret a user’s needs. In addition to voice activated digital assistants, the virtual assistant is revolutionising “typed” search through chatbots. When embedded in technologies like bots which converse in chat and with virtual assistants, the intent signals gleaned from cognitive abilities are allowing marketers to be more personal and impactful. When your branded bot is part of a conversation, your brand is effectively engaging one-to-one in real-time with a consumer, helping to form brand loyalty and increase basket conversion rates. Studies predict that by 2020 consumers will manage 85 per cent of their relationship with the enterprise without interacting with a human. Bots are becoming the new apps and in essence, companies using bots will be the ones making a difference and ahead of the curve. One such example of a traditionally “low-tech” business adopting chatbots to grow their business is The Purple Café in Bellvue Washington. This café is using a bot to immediately answer questions from potential customers, such as the restaurant menu, where they can park their car and how to make a reservation online. With this new turn towards a more fluid communication and a technology that better understands human intent, the opportunities for brands to develop impactful marketing campaigns is abundant. In order to keep ahead and make sure they are reaping all the benefits of the virtual assistant revolution, marketers should strive to adopt a multichannel strategy that incorporates digital assistants into their existing marketing ecosystem. Marketers should be using conversational language, optimising for voice search with the terms ‘who, what, where, why and how’ and be building business bots to be an integral part of the online exchange with consumers in the future. When this is balanced with human interactions between a brand and its consumers, the customer and brand relationship can be brought to the next level. To some, chatting or waving to technology seems like something that will happen in the far-off future, and not a present-day reality. A lot of businesses are making this mistake and thinking they can’t play in this ecosystem, meaning they miss the opportunity. But digital assistants, voice and other cognitive services are real, accessible for big and small businesses and being implemented now. The enterprises of today need to adapt their digital marketing strategies to be at the forefront of innovation, or risk losing out.